spd.io appears to be a dead site. Is this useful to you? I don't work w. photos, yet. The above seems to be what you want. Do look over the Affinity vids by themselves. 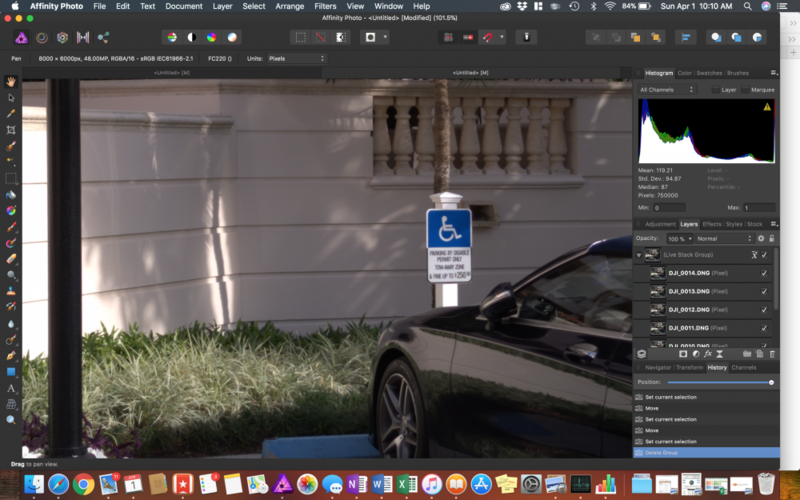 Lots of people spend huge amounts of time watching Photoshop , which has its own terminology and methods for doing much the same thing that Affinity doesdescribed by its own words and routines. It isn't spd.io, it's sdp.io, which identifies itself as Tony & Chelsea Northrup's link shortener. Can anyone break it down since I dont use Photoshop or Lightroom? Exposure merging: Merging images of varying exposures. Object Removal: Use a series of images to blend out unwanted subject matter from a specific image in an image set. Noise reduction: Blend together multiple shots of the same subject and average out the noise. Creative effects: Simulate long exposure imagery and combine bright subjects (e.g., fireworks) for a composite effect. A choice of operators can be applied to your stack depending on what you want to achieve. Median can be used for most blending operations such as object removal, exposure merging (exposure blending) and noise reduction. Mean—averages pixel content across the stack of images. Good for long exposure simulation and noise reduction. Median—removes pixel content that is not consistent in each image. Suitable for object removal and noise reduction. Outlier—exposes pixel content that differs in each image: great for sequence composites. Maximum—uses the maximum pixel values from each image. Can be used for creative exposure blending where the subject is lighter than the background. Minimum—uses the minimum pixel values from each image. Suitable for exposure blending where the subject is darker than the background. 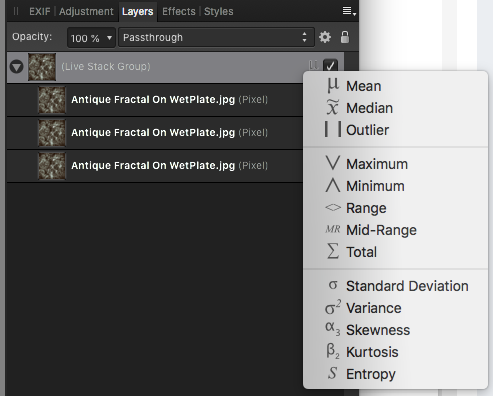 Range—indicates areas that change across the image stack. Good for analysing what has changed between each image. Mid-Range—uses the middle pixel values from each image. Can be used to increase tonal range if used with bracketed exposures. Total—produces the total value of pixels from each image. Usually results in overexposure, but can be used to lighten very underexposed imagery. Standard Deviation—analytical: measures the distribution of information between the images. Useful for object removal as it clearly indicates areas that will be averaged out with a Median operator. Variance—analytical: as Standard Deviation, indicates how pixel values are spread between images. More intense distributions are shown very clearly. Skewness—analytical: highlights edge detail and indicates the intensity of pixel value distribution. Can be used to determine tonal and spatial differences between images. Kurtosis—analytical: detects the peakedness of an image. A brighter result represents low noise levels and a tonal uniformity (most pixels at dominant grey level). Darker results represent greater noise and less tonal uniformity (more pixels further away from dominant grey level). Entropy—analytical: represents the number of bits required to encode information in the stack. Could be used with stacked video frames (within the same scene or shot). From the File menu, select New Stack. 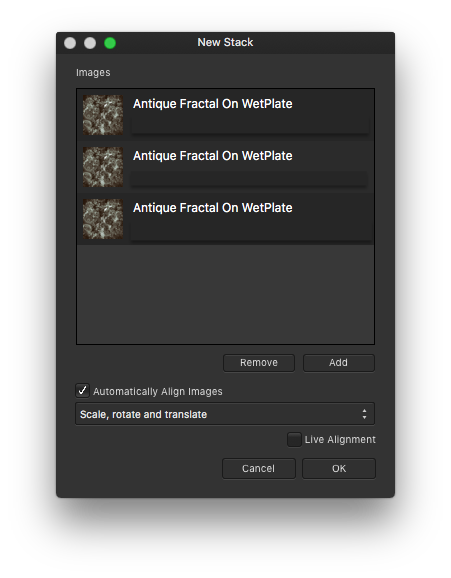 From the dialog, click Add to locate and select your images for blending. Click Open to add the images to the stack list. (Optional) Uncheck Automatically Align Images to manually align images later in the Layerspanel. Choose a Perspective or Scaling operation from the menu to allow for successful auto-alignment. The former applies a perspective adjustment to each image; the latter repositions and/or sizes the image layer. 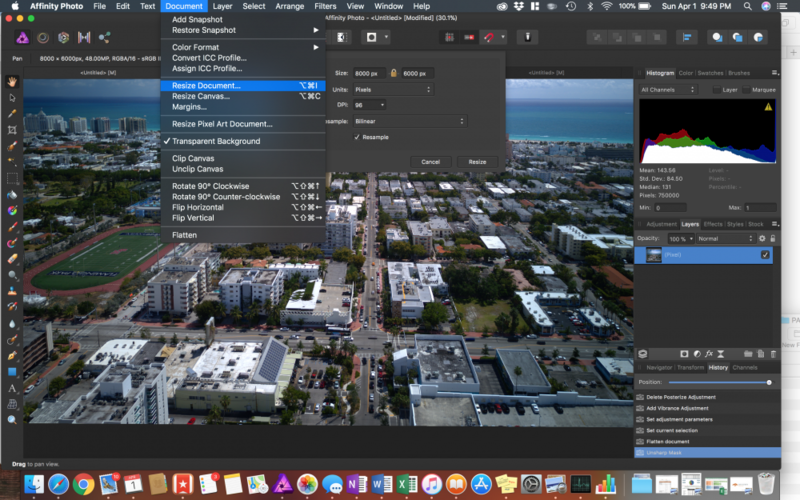 Check Live Alignment to allow the above perspective adjustment to be made non-destructively (this may affect performance depending on size and number of images to be stacked). Your images are blended and presented in a Live Stack Group in the Layers panel. You can manually align layers if auto-alignment isn't 100% accurate. Once stacked, you may notice 'checkerboard' transparency at the very edge of your stack group. This is an intentional result of auto-alignment and can be either cropped away or, if you're merging the stack image layers together, inpainted out instead. On the Layers panel, click the Stack operator icon on the Live Stack Group. The default operator is Median as indicated by the icon. From the pop-up menu, select a stack operator suited to the type of photos you are stacking (see above). The icon will change depending on the operator selected. Once you've applied a stack operator, the image layers in the stack shouldn't require manipulation (of opacity, blend modes, blend ranges, etc.) except for possible re-alignment (if auto-adjustment was not satisfactory). However, depending on image content you may need to apply additional adjustments to the stack or mask some areas for best results. 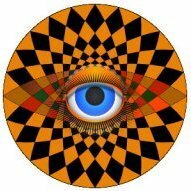 So I stacked all the images (see attachment) . How to I make adjustments to the group like increasing sharpness, adding saturation (so it will be applied to all the images) ? see your image edited below. Just play about and have fun see what you can get. Thank you so much, I was able to make some adjustments but is the clarity tool there the only one to increase the sharpness? is the clarity tool there the only one to increase the sharpness? No. As @firstdefence indicated, you can use the unsharp mask filter instead. Essentially this works by performing edge detection and then selectively increasing the contrast along those edges. I have to say, doing this in Affinity Photo is a lot easier than doing it in Adobe, minus the Action part of course. so I uploaded 7 raw images and my try of a stack to archive the "super resolution". since i have no experience in editing you might be able to archive much better results than I do. Generally asking - do you see a difference? @dronecrasher just been tinkering with your dog's, (No animals were harmed in the typo of dng's) I read a bit of the post from that link and there was some good info on resizing before stacking the dng's, this link was a good read too. Affinity can't resize a raw file as far as I can see, so I opened them in Rawtherapee tweaked them and resized them to a 2x scale, that made each file 24.3MB, then I created a stack in Affinity Photo (APh) applied a few filters and ended up with this. Dog's legs? Dog's bone? Other?? Oh, wait ... did you perhaps mean to type "DNGs"? @dronecrasher just been tinkering with your dog's, I read a bit of the post from that link and there was some good info on resizing before stacking the dng's, this link was a good read too. Affinity can't resize a raw file as far as I can see, so I opened them in Rawtherapee tweaked them and resized them to a 2x scale, that made each file 24.3MB, then I created a stack in Affinity Photo (APh) applied a few filters and ended up with this. 3) Your first posted link (petapixel) - Point Nr 3 & 4 - How to I auto sharpen the images then? Where do I find it in Affinity? "Average the layers" is totally confusing. What does he mean and how do I do it? There isn't an option to resize/scale a RAW file while editing that RAW file in Develop Persona in Affinity Photo (APh). In Rawtherapee you can scale the DNG file as part of the editing and still retain the file as a DNG. Your first posted link (petapixel) - Point Nr 3 & 4 - How to I auto sharpen the images then? Where do I find it in Affinity? 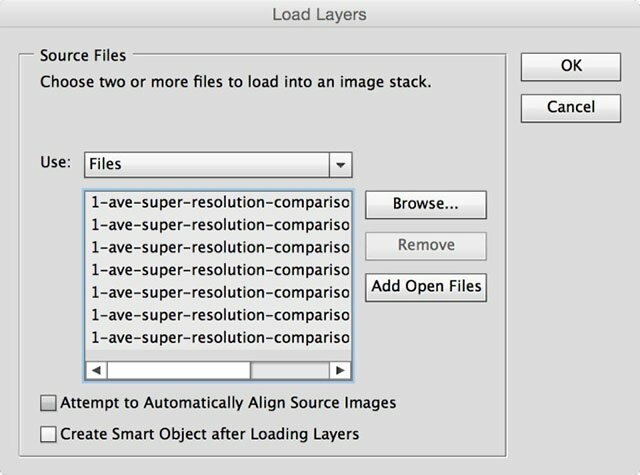 "Average the layers" is totally confusing. What does he mean and how do I do it? I think what the OP of that post is alluding to is the subtle variations in image position that careful hand-held photography will get you. As part of the process he is saying that the subtle variation of position is what makes the super resolution possible. You will still have to let the stacking process align the images but because of the slight off-set in the images even with aligned images you will get a better variation of pixel. I think the only way to see this is to take the scene with a tripod at eye level and then do it in the same position hand-held. Stack the images and see if the hand-held is a better effect. If you are taking a specific image you might want to compensate for any cropping you may have to do after stacking a hand-held set, so zoom out a little to allow for cropping. I might if I have time go and try this myself, although it snowed this morning so it's pretty much just white outside at the moment. thanks again for your detailled response. If you find time today/tomorrow please try it out and let me know! BTW : So you are saying I should resize the RAWs instead of the JPEGs to get the result? No, as @firstdefence said, resizing the raw has to develop it first before saving as a .dng, so you are not gaining anything. Providing you save or export in a lossless format (such as .afphoto, .png or .tif) you will preserve all necessary infomation. I would load each raw file, develop each using the same preset for each, apply, resize 200% and then save/export. Then you can load your files into an appropriate stack. Hi John Actually, I do mean resize the Raw file by 200% This is in the original instructions for super resolution, not sure why this would be but people are saying this is a prerequisite for getting a super resolution image. Affinity's Develop Persona can't scale a RAW file so I used Rawtherapee instead. There’s a specific order of operations in processing that will allow us to combine our stack of photos into a final image with noticeably finer detail. We’ll import our photos into a stack of layers in Photoshop, upsample the photo (usually 200% width/height) with a simple nearest neighbor algorithm, re-align the layers, and then average the layers together. This is an awesome technique and one I shall be using on well chosen subjects, with good contact and plenty of detail. What you say may be true, but I cannot see the logic of it. (Even if it is true, I don't believe it!) Even Raw Therapee has to develop the image before scaling it, so 'scale the RAW file' is not what is happening. Unless you can point me to how I can rescale a raw file in Raw Therapee. I cannot find anything on this in the RawPedia.